UCAS Applications - How we can help? We are a registered UCAS application centre in Singapore and we have been helping students study in the UK since 2002 with great success. We have been appointed by 50% of the Top 20 UK Unis to provide free assistance for UCAS applications for 2016 intake. This free assistance is available to all students studying in Singapore, including A level, High School Diploma, IB and Polytechnic graduates, and students with equivalent qualifications. You can apply to 5 universities of your own choice. You are eligible to choose from all the universities across the UK. You may also ask for our recommendation or guidance. Other than providing information on the University ranking, we have received many feedback from the students that we have sent and also visited many Universities and hence able to provide information of the niche areas of each university. 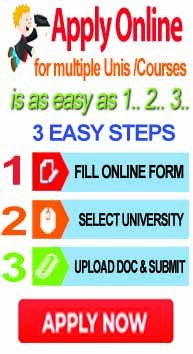 Try our Free UCAS Application Service Without Any Obligations! You are most welcome to use our free services or attend our Free UCAS Advisory Session. 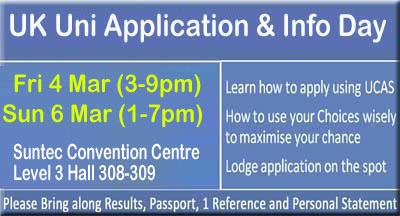 Pls bring the following documents (original) for your UCAS application when you visit us at our office or at SUNTEC. The UCAS application fee is £24 for the application. This is a standard one-time fee paid online by all international students directly to UCAS for the applying to the 5 Universities. 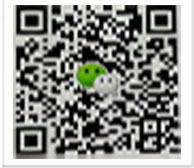 If you use our free service, we are happy to pay for the application fee. Our service itself is free as we have been appointed by our partner Universities to provide this service to you for free. You don’t need to pay for our service. No other fees are charged. Why Apply to UCAS through us? We assist you with objective advice on the selection of Universities so as to maximize your chances of being accepted and also receive multiple offers from Universities according to your criterions. We expedite your application by forwarding your supporting documents and communicate directly with the Universities that we represent. 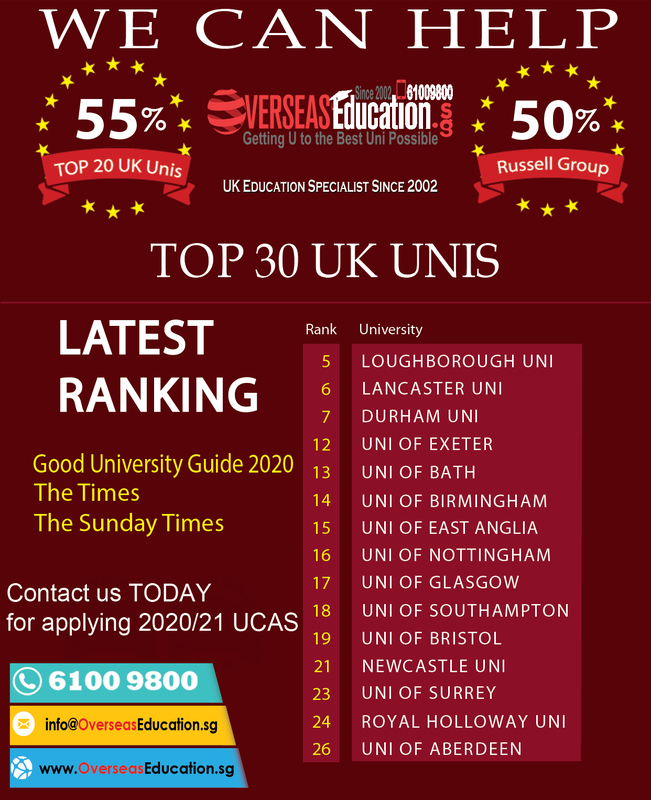 We provide one of the largest selection of UK Universities (if not the largest) (close to 40% of the Top 100 UK Universities) among all the educational consultants operating in Singapore. You are welcome to choose from the Universities we represent or other universities in your UCAS application. We pride ourselves in offering transparent and open dealings. We request you to register the UCAS account using your own email and use your own password. In this way, you have full control of your UCAS application so that you have full knowledge of the status of the application at your fingertips. We are run by a team of dedicated Singaporeans, well versed in the Singapore education system and culture, and committed in helping students for the UK since 2002. Moreover, our services are free as we have been appointed by our Universities to provide these services and we will be able to assist you with your visa application, securing on-campus accommodation, opening bank accounts and travel arrangements. Deadline for the UCAS Application? If you apply from 15th Jan 2016 to June 2016, your application will still be considered and you will still be eligible to secure a place in many UK Universities. From July 2016 onwards, the application lodged will be in the Clearing Stage. Don't fret if you have not secured an offer or if you have accepted an offer and wish to consider more options. Contact us at 6100 9800 to find out about clearing vacancies available as we are in contact with many Unis with latest info on vacancies available. In many cases, we are still be able to process your application even after the above deadline as the Universities associated with us will let us know if there are courses that are “under-subscribed”. However, we encourage you to apply early so that you can get a decision earlier.